What's it like to work with Adam Sandler? What’s It Like to Work With Adam Sandler? 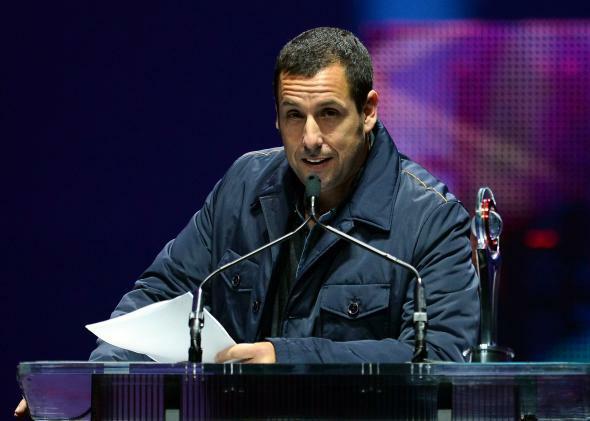 Adam Sandler speaks at the CinemaCon Big Screen Achievement Awards on March 27, 2014, in Las Vegas. I worked with Adam Sandler and his Happy Madison crew a lot during my Sony days as a studio liaison. This is a guy whose movies reap an ongoing profit for Sony and other studios. Like his movies or not, he’s one of the most consistent movie earners in the business and has been for quite some time. And despite all of that, he’s an amazing guy. He carries no movie star bravado. When he wants to play basketball at the Sony Athletic Center with his Happy Madison crew, he doesn’t request that the courts be reserved for them alone. He could, but he doesn’t. He and his crew call next game like every one else. If they lose, they let the next team up play. When we first met, he and I were the only ones in the gym. I was running on the treadmill, and he entered. After I was done, he approached me right away and started a conversation that would last quite awhile. When he found out that I was from Wisconsin and had lived in Madison, the conversation went to his late good friend Chris Farley, who was born and raised in Madison. When he and I were playing basketball, my knee blew out (ACL tear). He carried me off of the court, ran to get me some water, and didn’t leave my side until he knew I was alright. Beyond that personal experience, he’s known as one of the most genuine and kind movie stars. He’s an amazing husband and father. For a guy that can command $20 million per picture and has been doing so since the ‘90s, he’s one of the most down-to-earth individuals in that position that I’ve ever come across. On the lot, we had an actress who was a co-star on a hit show. She was a horrible person, a true diva. Comparing her to Adam is like night and day … and this is a guy who was vastly more prominent on the lot and in the business than her. I can’t say enough about Sandler. He’s one of the reasons I miss studio life the most. (I relocated back to Wisconsin to raise our kids close to home.) Not because we were best of —we weren’t, and he likely doesn’t remember me. And not because of a star infatuation, because I don’t get starstruck. But because he’s living proof that you can be overly successful without turning into a diva or prick. I always felt that when any special attention went his way, he always did his best to deflect it, as if he either felt it wasn’t deserved or wasn’t needed, or maybe both. I’ve been fortunate enough to meet many actors. He, by far, is the best person in that position that I’ve met. Celebrities:What famous person did you go to school with? Movies: What is the best psychological thriller movie? Actors and Actresses: Which child actor has delivered the best performance in a film of all time, and why?